These are First Responder Go Bags with modular, personalized organization of mission essential gear AND medical equipment needed in response to an Active Shooter scenario. Exterior of the rugged nylon shoulder bag features adjustable, padded strap with quick release buckle. 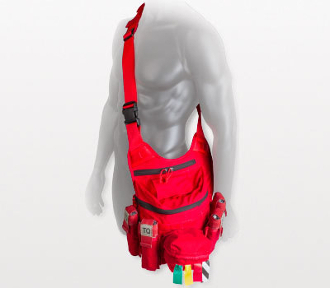 Multiple storage capabilities including loop-tape/MOLLE attachment system, 2 extra pockets & elastic storage loops with color-coded labels to accommodate up to 8 chem lights (not included). Interior compartment features 3 fixed mesh pockets and repositionable elastic loop panel for secure equipment storage. The Rescue Task Force Rapid Response Kit is equipped to provide initial triage of an MCI and provide treatment for 4 or more patients. MOLLE'd on the exterior are 4 C-A-T® tourniquets with holders and nylon dispenser equipped with 4 rolls of color-coded triage tape. Available in Red or Black nylon colors. Kit Dimensions: H 12 in. x W 12 in. x D 6 in. Adjustable shoulder strap - 28 in. to 50 in.